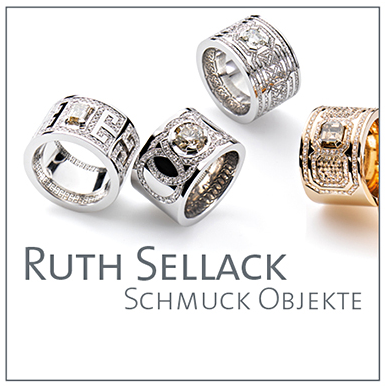 The jewelry designer and master goldsmith Ruth Sellack designs and forges exquisite, unique pieces of her own creation. Ruth Sellack's goldsmith workshop is located at the far end of her architecturally unusual retail shop in the heart of Stuttgart’s city center. All her collections share a common design language –and their distinctive details are what makes them each so special. Creation and brand in one. Unlike more traditional jewelers who, for the most part, tend to sell collections from other designers, Ruth Sellack offers her own artisanal creation and brand in one. She herself is the source of her pieces’ characteristic design, uniquely combining forms and colors to create rings, necklaces and earrings. At first glance, Ruth Sellack’s jewelery is minimalistic, with a very clear design language. Upon closer inspection, the jewellery’s distinctive character is revealed in the details. Her art is achieving balance between simplicity and opulence, the classical and the fashionable. The ambiance of her shop reflects this interplay through its simple elegance. A striking architectural element forms a partition between her retail space and creative workshop − where artisan perfection can be discovered: unique jewelery and select pieces produced using traditional craftsmanship according to Ruth Sellack’s own designs. A place for true lovers of one-and-only pieces of jewelery that will be companions for an entire lifetime. Precious, classy, yet with a degree of understatement. Typically, Ruth Sellack! Ruth Sellack was awarded the German Design Award Special 2019 for her ring “Gordon”, by the German Design Council. Crafted in white gold with diamond and small brilliants the ring placed in the category: Excellent product design. The ring “Gordon” impressed the German Design Council, because of its outstanding composition expertise, it was nominated and just now awarded with the price. We also host exclusive presentations of our newest collections for our valued customers. If you are interested, we will be honored to keep you up to date on any of our events, new jewelry creations and exhibitions. The events are happening once or twice a year. We would be more than happy to send out invitations to you. Sign up for our newsletter under www.ruth-sellack.de.